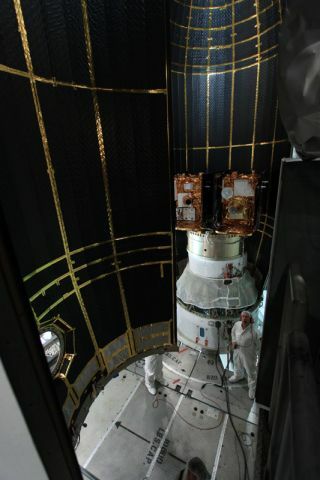 At Space Launch Complex 17B on Cape Canaveral Air Force Station in Florida, the second half of the clamshell-shaped Delta payload fairing swings into place around NASA's twin Gravity Recovery and Interior Laboratory spacecraft under the scrutiny of a spacecraft technician. NASA is gearing up to launch a set of twin spacecraft on a mission to map the moon's gravity on Thursday (Sept. 8), but Mother Nature may not cooperate. The twin Grail probes, which will study the moon's gravitational field in unprecedented detail, are slated to blast off from Florida's Cape Canaveral Air Force Station Thursday at 8:37 a.m. EDT (1237 GMT), with a second launch opportunity about 40 minutes later. But clouds and thunderstorms are expected to linger near Florida's Space Coast for the next few days, making a delay more likely than not, officials said. "We're going to be sandwiched in between probably two areas of thunderstorms," Grail launch weather officer Joel Tumbiolo, of the Air Force's 45th Weather Squadron, told reporters today (Sept. 6). "Right now, the forecast for the beginning of the launch window is a 60 percent chance of violation." "Those days look improved, so we're looking forward to that," Tumbiolo said. The two Grail spacecraft have a 42-day launch window that extends through Oct. 19. So the $496 million mission should have plenty of chances to get off the ground, despite the storms churned up during an active Atlantic hurricane season. The spacecraft are expected to settle into orbits just 34 miles (55 kilometers) above the lunar surface, then chase one another around the moon for three months while keeping close track of the distance between them. This distance will change slightly as they travel, owing to regional differences in the moon's gravitational field. The two spacecraft, known as Grail-A and Grail-B, will be able to gauge these distance changes with incredible precision, though the probes will be 75 to 225 miles (121 to 362 km) apart. "What we're trying to measure is the width of less than a human hair," said John Henk, Grail program manager at Lockheed Martin Space Systems in Denver. These precisely determined distance variations will allow researchers to map out the lunar gravity field 100 to 1,000 times better than has ever been done before, researchers said. Knowing the gravity field so well will yield insights into the moon's structure and evolutionary history. "We will learn more about the interior of the moon with Grail than all previous lunar missions combined," said Ed Weiler, associate administrator at NASA's Science Mission Directorate in Washington. That information should in turn tell scientists a lot about how the other big, rocky bodies in the inner solar system — Mercury, Venus, Earth and Mars — formed and evolved as well, researchers have said.